Yesterday it was exactly one month after Liss' birthday and exactly one month before my birthday, so already in february we had decided to go and celebrate that by eating at Häagen-Dazs. We had seen that they served a chocolate fondue with fruits and small scoops of different flavoured ice cream, and it looked just so wonderful in the picture that we didn't mind the high price. 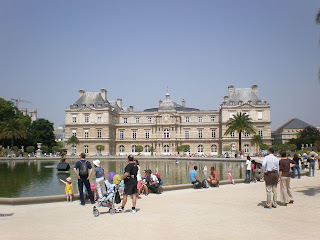 But before that, I enjoyed the sunshine by walking in to the city center and then chilled in Jardin de Luxembourg while reading a new book and waiting for Liss to come. Then we went to the Häagen-Dazs restaurant, all ready for the ice cream experience. But then it turned out that they had the fondue only during the winter season!!! NOOOO!!! In four long months we had been waiting for this day to come just to be able to eat it, and then tehy don't have it on the menu anymore! But ok, then we chose something other from the menu and I have to admit that even though I was a bit dissapointed not to be able to eat the chocolate fondue, the ice cream I had was till super! Mmm! Chocolate ice cream with pieces of brownie and some chocolate sause :P Not bad at all, huh? 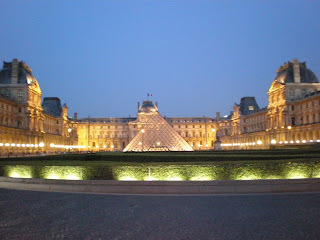 Then in the evening we gathered up with some others for a picknick in Jardin de Luxembourg, but since the parks here in Paris aren't like the parks in Helsinki, that is open 24/7, we have to continue to another place when they closed it at 21.00. I find this a bit weird, but in the same time it's a good thing. The parks are cleaner and in better condition when nobody gets to them during the night. After wandering here and there in the city, and seeing the Louvre by night, we eventually found ourselves on Pont des Arts again. And there we sat till around midnight :) So not at all a bad pre-birthday!